Nutrient salts are an easy, reasonably-priced variant with which you can mix your own aquatic plant fertiliser or for adding the salts directly to your tank. Nutrient salts contain nitrogen (as urea), phosphate or potassium. Epsom salt (magnesium sulphate) can be used to harden the water or to prevent magnesium deficiencies. Specifically developed iron chelates supply the aquatic plants with all the iron they need. With these nutrients, your aquatic plants can draw on plentiful resources, which will result in lush growth. Fertilizers for planted aquariums in the form of nutrient salts are also available in our online shop. 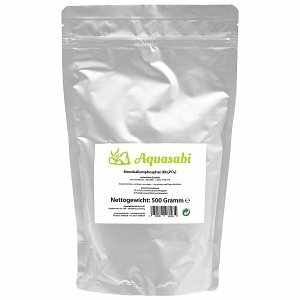 These nutrient salts are suitable for all aquarists who want to mix their own fertilizers and need high-quality raw materials. We offer fully water soluble, technical grade Aquasabi brand nutrient salts for your aquarium plants, in doypacks of 500 and 100 g. With potassium sulphate, potassium dihydrogen phosphate, urea and magnesium sulphate you can supply your aquatic plants in aquariums and aquascapes optimally and adapted to their needs. The price-performance ratio is nothing to scoff at, either. 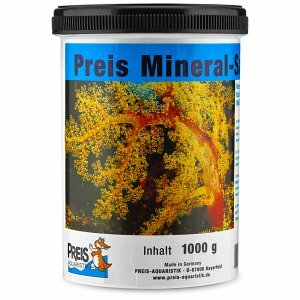 The iron fertilizer Fetrilon from Compo is available from our webshop as well, for a targeted provision of your aquarium's or aquascape's plants with iron. 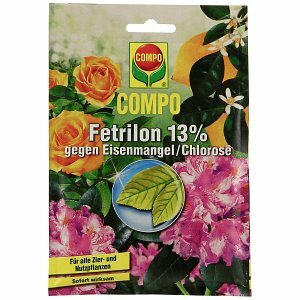 This prevents chlorosis and weak leaf colours. This fertilizer is not a special aquarium fertilizer, but we have already tested it many times in aquaristics and found it to be all-out suitable. For use in a planted aquarium, a corresponding amount of Fetrilon is simply dissolved in water and added to the aquarium. We explain which nutrient is deficient, how this becomes noticeable in the plants in an aquarium, and how to remedy deficiency symptoms with fertilizers in our Aquascaping Wiki.